Tonight I made Sweet and Spicy Slow Cooker Chicken and was planning on using it to make tacos, but then I decided to try making some home made taquitos instead...and they were delicious (although less healthy!)! 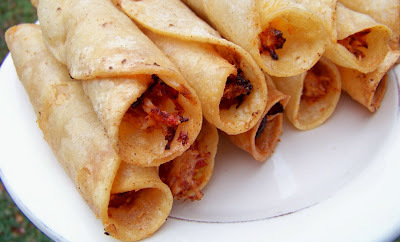 -Heat enough oil in pan to cover tortillas when rolled up. -Place a small amount of cheese down center of tortilla, then top with some of your meat mixture (to make my corn tortillas easier to work with I place 3 in a paper towel, wrap them up and heat in microwave for 30 seconds). 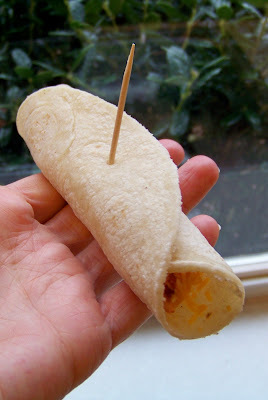 -Tightly roll up tortilla and place 1 or 2 toothpicks in to hold in place. -Place in hot oil until they turn golden brown. I made these tonight, including the Spicy Slow Cooker Chicken. My family LOVED them! We used up every tortilla in the bag and some of the teenage boys probably could have eaten more. Thanks for the great recipe! mmmm i might be making these this week! i just happened upon your blig- they look amazing!